赵厚宇, 边佳明, 卓琳, 王敏敏, 孙凤, 张梅, 詹思延. Zhao Houyu, Bian Jiaming, Zhuo Lin, Wang Minmin, Sun Feng, Zhang Mei, Zhan Siyan. Zhao Houyu, Bian Jiaming, Zhuo Lin, Wang Minmin, Sun Feng, Zhang Mei, Zhan Siyan. 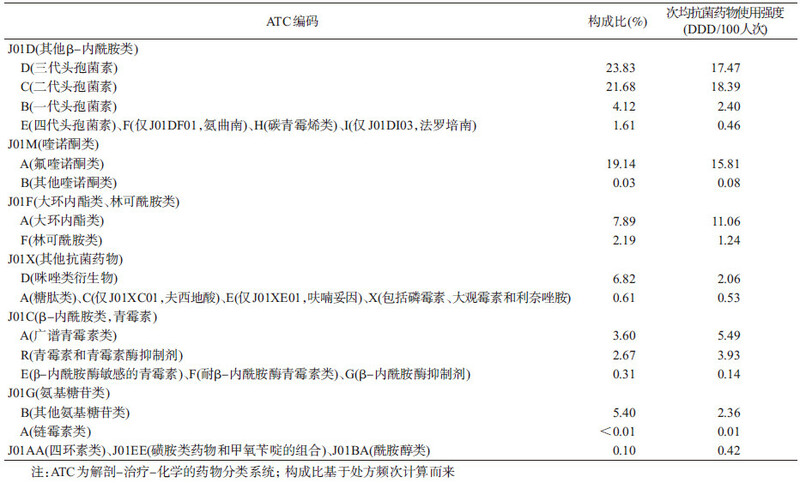 Antibiotic use in emergency departments of class Ⅲ general hospitals in China[J]. Chinese Journal of Epidemiology, 2018, 39(7): 959-965. Abstract: Objective To investigate the utilization of antibiotics in emergency departments (EDs) of class Ⅲ general hospitals in China. Methods Data from a national monitoring network for rational use of drugs was used. The data included prescriptions of EDs from 114 class Ⅲ general hospitals in 30 provinces (autonomous regions, municipalities) of China. A total of 10 260 595 prescriptions from October 1, 2014 to December 31, 2016 were extracted. The Anatomical Therapeutic Chemical Classification/Defined Daily Dose (DDD) system was used for the classification of antibiotics and calculation of antibiotic use intensity. An auto-regression model was used to analyze the trend over time and seasonal variation of antibiotic use in EDs. Results The rate of antibiotic prescriptions was 27.82% in EDs, among the antibiotics prescribed, 25.58% were for the combination therapy with 2 or more antibiotic agents, and injectable antibiotic prescriptions accounted for 60.59%. Besides, the number of DDDs per 100 patient visits was 81.84. Broad-spectrum agents were the most commonly used antibiotics, among which the second and third generation cephalosporins, quinolones and macrolides accounted for 23.83%, 21.68%, 19.17% and 7.89% of all prescribed antibiotics, respectively. The use of antibiotics, including prescription frequency and use intensity, in EDs had a slight but significant increase tendency (P < 0.05), and the seasonal variation of antibiotic use in EDs was obvious, characterized by the highest frequency and intensity of antibiotic use in winter, the differences were significant (P < 0.05). 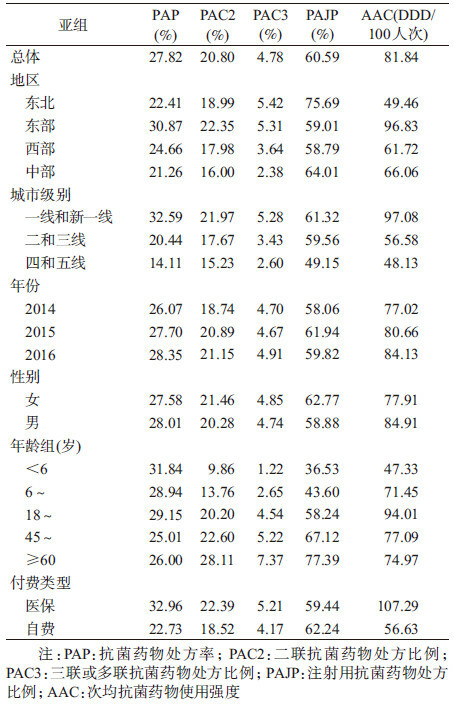 Conclusion The antibiotic prescription rate in EDs of class Ⅲ general hospitals in China was controlled at a low level, but the proportions of broad-spectrum antibiotics and injectable antibiotics were high, and a significant increase trend in antibiotic use in EDs was found. 肖永红, 沈萍, 魏泽庆, 等. Mohnarin 2011年度全国细菌耐药监测[J]. 中华医院感染学杂志, 2012, 21(23): 4896–4902. Xiao YH, Shen P, Wei ZQ, et al. Mohnarin report of 2011:monitoring of bacterial resistance in China[J]. Chin J Nosocomiol, 2012, 21(23): 4896–4902. 肖永红, 侯芳, 王进, 等. 抗菌药物不良反应的社会与经济后果调查[J]. 中国卫生经济, 2010, 29(5): 94–96. WHO Collaborating Centre for Drug Statistics Methodology. ATC/DDD Index 2017[EB/OL]. (2017-04-02)[2017-07-01]. https://www.whocc.no/atc_ddd_index/. 国家药典委员会. 中华人民共和国药典(2015年版)(二部)[M]. 北京: 中国医药科技出版社, 2015. Chinese Pharmacopoeia Commission.Pharmacopoeia of the People's Republic of China 2015[M]. Beijing: China Medical Science and Technology Press, 2015. 陈新谦, 金有豫, 汤光. 新编药物学[M]. 17版. 北京: 人民卫生出版社, 2011. Chen XQ, Jin YY, Tang G.New Pharmacology[M]. 17th ed. Beijing: People's Health Publishing House, 2011. 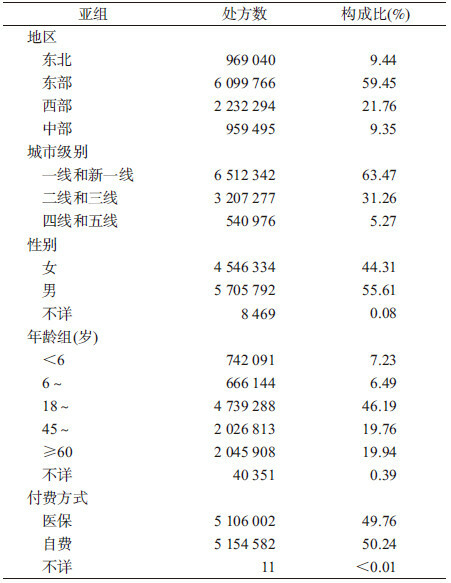 National Bureau of Statistics of the People's Republic of China. The divide of regions according to economic development in China[EB/OL]. (2011-06-13)[2017-06-11]. http://www.stats.gov.cn/ztjc/zthd/sjtjr/dejtjkfr/tjkp/201106/t20110613_71947.htm. 观察者网. 2017城市商业魅力排行榜: 什么样的城市才是最好的城市[EB/OL]. (2017-05-25)[2017-10-06]. http://www.guancha.cn/TMT/2017_05_25_410118.shtml. Guancha Syndicate. China's city commercial charm rankings in 2017: what kind of city is the best city[EB/OL]. (2017-05-25)[2017-10-06]. http://www.guancha.cn/TMT/2017_05_25_410118.shtml. 王燕. 应用时间序列分析[M]. 3版. 北京: 中国人民大学出版社, 2010. Wang Y.Applied time series analysis[M]. 3rd ed. Beijing: China Renmin University Press, 2010. Oracle Corporate. Oracle® Database 11g[CP/OL]. (2014-06-04)[2017-11-19]. http://www.oracle.com/technetwork/database/database-technologies/express-edition/downloads/index.html. Ministry of Health of the People's Republic of China, Notification for continuing to further promote the special campaign of antibiotics rational use in hospitals[EB/OL]. (2012-03-06)[2016-12-17]. http://www.moh.gov.cn/mohyzs/s3586/201203/54251.shtml. W HO.Using indicators to measure country pharmaceutical situations[M]. Geneva: WHO, 2006. 张晓鹿, 马泽彬, 贺罡. 某医院门诊、急诊实行电子处方的效果评价[J]. 宁夏医科大学学报, 2016, 38(7): 842–845. 范天骄. 探讨急诊内科抗生素应用的临床合理性及耐药性[J]. 海峡药学, 2015(12): 204–205. 石燕来. 2014年广西科技大学第一附属医院门急诊抗菌药物应用分析[J]. 中国医院用药评价与分析, 2015, 15(10): 1377–1379. Mohajer KA, Al-Yami SM, Al-Jeraisy MI, et al. Antibiotic prescribing in a pediatric emergency setting in central Saudi Arabia[J]. Saudi Med J, 2011, 32(2): 197–198. WHO. Promoting rational use of medicines: core components[EB/OL]. (2002-01-01)[2017-10-01]. http://apps.who.int/iris/bitstream/10665/67438/1/WHO_EDM_2002.3.pdf. China Food and Drug Administration. Annual report of national adverse drug reactions monitoring in 2016[EB/OL]. (2017-05-02)[2017-10-01]. http://news.pharmnet.com.cn/news/2017/05/02/469036.html. WHO. Using Indicators to Measure Country Pharmaceutical Situations[Z]. Geneva: WHO, 2006-2017. Adriaenssens N, Coenen S, Versporten A, et al. European Surveillance of Antimicrobial Consumption (ESAC):outpatient macrolide, lincosamide and streptogramin (MLS) use in Europe (1997-2009)[J]. J Antimicrob Chemother, 2011, 66(6): vi3–45. Minderhoud TC, Spruyt C, Huisman S, et al. Microbiological outcomes and antibiotic overuse in Emergency Department patients with suspected sepsis[J]. Neth J Med, 2017, 75(5): 196–203.